Today we have another guest post from Paul Denikin. Please feel welcome to share it with your first time buyers. Owning your own home is an adventure. Yet, alongside those big dreams are some big responsibilities and the need to prepare for just about anything. 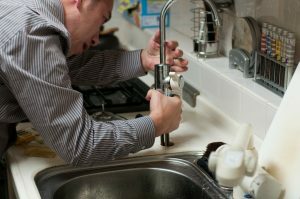 You no longer have a landlord to rely on, and you must be self-sufficient when it comes to major repairs. When you have your own property, the responsibility of maintaining it lies with you. Homeowners insurance is a good place to start for emergencies, but it may not be enough. For instance, insurance rarely covers neglect and natural disasters, the latter of which can strike at any time. Because of this, you need to put away the difference between your mortgage and what you would be paying for a comparable property in monthly rent. Aim to have at least $2,000 in savings at any given point, as emergencies are unpredictable and can be devastating. Knowing how to choose a contractor can be the difference between a reasonable payment and thousands for unnecessary repairs. Before you call in a professional, know what needs to be done. Get references from friends, and always bring in multiple candidates to give competitive bids. A good contractor won’t try to use scare tactics to pressure you into snap decisions, nor will they demand cash up front or only give you a verbal quote with no warranty. These are all red flags that should give you pause. Otherwise, you might get shortchanged or charged unfairly for poor work, or you may pay for a repair that never gets done. One crucial aspect of taking care of our homes is looking after our HVAC system. When it breaks due to negligence and disrepair, it can cost between $3,000 and $5,000 to replace — and that’s for a mid-range unit. To save money, care for it well by cleaning the condenser outside, checking the drain pain and cleaning the drain itself, as well as regularly changing filters. After all, filters are essential to your system staying in excellent condition. Be sure that the one you choose is the correct size, which should be written on the side of the filter itself. To keep from forgetting, use a permanent ink marker and write it down on the inside door of your HVAC unit, or the filter housing. Make sure it has a MERV rating of six, as the higher the number, the more particles it will keep out of your home. Swapping the filter isn’t a sure-fire shot at maintenance, but it can ensure the health of your system. Your HVAC isn’t the only area of the home that needs regular attention. Every month, systematically confirm that your property is sufficiently looked after by knowing what needs to happen. Different seasons require different inspections, so adapt your charts or checklist accordingly to what should be done and when. For instance, early spring is an opportune time to look at your drainage, as rain may be just around the corner, while the summer months could mean your home needs a fresh coat of paint to protect external walls from the sun. Keep up your momentum by being proactive with cleaning and repairs. There are many basic tasks you can do with the right guidance and hardware. At the least, clean your gutters regularly, and treat wooden floors to keep them in good condition. You should also maintain the tile in your bathrooms or kitchen by cleaning and regrouting when required. These small steps will save you money in the long run by preventing vital parts of your house from breaking down. You may think you’re cutting expenses every month when paying your mortgage versus rent, yet any difference ought to go into your savings. When you’re prepared for an emergency, you’ll not only rest easier, but you can also feel confident in your ownership. Purchasing and maintaining a home is a journey, one that should be joyous, not stressful. Paul Denikin got into DIY home repair projects after his daughter was born with special needs. His initial efforts were all motivated by the desire to make his home more accessible for her. He created DadKnowsDIY.com to share some of the great resources he’s come across and to offer home improvement project how-tos and other accessibility information.